Photosynthesis is the most important energy process in the world. The energy of sun transformed to nutrition at plants by photosynthesis. Thus plant production capacity affecting directly from sun. The element of Iron (Fe) is necessary for chlorophyll pigment synthesis which is responsible from photosynthesis by capturing sun lights. Light green/yellow color between veins is the clear deficiency symptom of iron and means that plant health is not well. At the beginning of deficiency, between veins turn yellow while the veins remain green. At further deficiency whole leaf turns to yellow. The iron chelates in the market can treat deficiency symptoms partially but Doctoferro48 is the exact solution with its high efficiency and low dosage different than others. -	Chemical quality of Doctoferro48 comes from high ortho-ortho EDDHA chelate. 80% of its 6% EDDHA chelate is chelated with ortho-ortho isomer (4,8%). -	Dectoferro48 is the most effective iron chelate in the market. It is active even in high pH soils and effect rapidly according to other iron preparates. -	Doctoferro48 solubility is perfect. Its micro granule structure dissolves easily and dust-free. -	It treats iron deficiency at plants in a very short time. -	It is one of the necessary elements for biological nitrogen bond. -	Sufficient amount of available iron is needed for protein synthesis. -	It is responsible from O2 (Oxygen) transport at chlorophyll synthesis. -	It is an important part of the enzymes responsible from respiration. -	Increases leaf thickness. Encourages nutrition uptake and yield. -	Fe increases leaf color intensity (darker) and plants can use sun energy more efficiently with it. -	Excess manganese (Mn) in soil. -	Extreme cold and wet soil conditions. 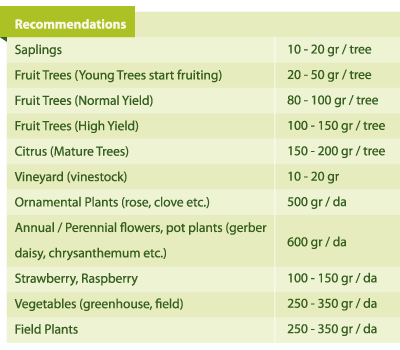 -	High calcium (lime) rates in soil. -	Application of fertilizers contain lime or direct lime application. - High pH soils prevents Fe uptake of plants. -	Fe should be applied with the beginning of spring for trees. For Citrus, application should be done before summer. -	Application should be done with planting or with the start of vegetative activity at ornamental plants and horticultures. 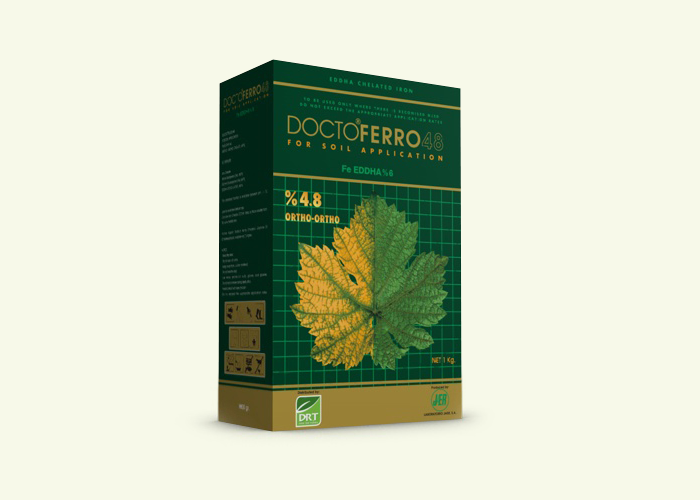 -	The result of Doctoferro48 application can be observed at the first week and with new leaf formation. It rapidly treats chlorosis effect of Fe deficiency. Plant parts become darker green and healthier after application. -	Doctoferro48 can be applied to soil inside water solution, with irrigation methods like surface irrigation, injection and drip irrigation. -	If necessary foliar application is also beneficial. -	It can be easily applied to drip line of trees by mixing soil at orchards and vineyards. It is important to make necessary amount of irrigation after application. -	Do not mix Doctoferro48 with fertilizers and pesticides contain Cu and/or Pb. Low dosages are effective with drip irrigation method. -	It is beneficial for winter plants directly. It supports and stimulates plants. 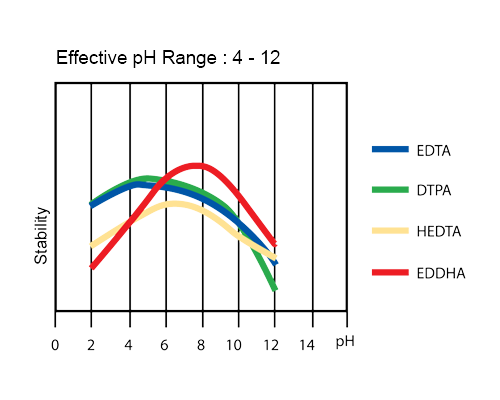 EDDHA is the most effective chelate against chlorosis caused by iron (Fe) deficiency at high pH soils. However only ortho-ortho isomer (o-o EDDHA) strongly bonds with iron chemically and become very effective iron preparate even in limy soils. 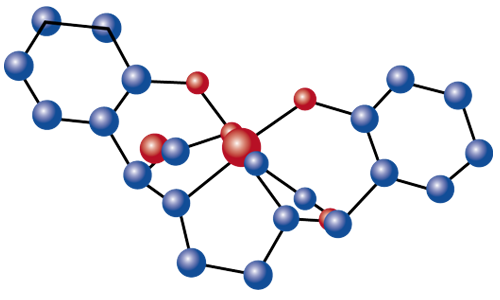 Ortho-Ortho isomer is the most effective one between three EDDHA isomers formed during EDDHA chelate synthesis. 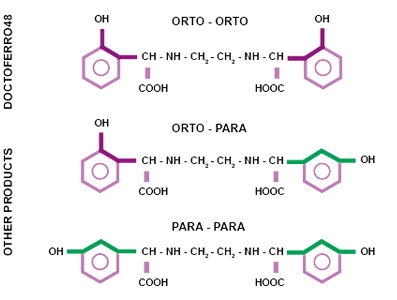 Ortho-Para and Para-Para isomers can’t bond strongly with Iron as Doctoferro48 can with its Ortho-Ortho isomeric EDDHA chelate. This shows the quality of chelate that Doctoferro48 contains. DoctoFerro48 Brochure Download click here!